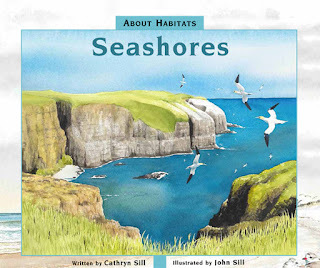 About Habitats is celebrating its 10th Anniversary with About Habitats: Seashores! Get ready to feel the sand between your toes in the newest installment of Cathryn and John Sill’s award-winning nonfiction series. Very young readers will learn about the fascinating ecology of where the ocean meets the land through simple, descriptive language and beautiful, accurate illustrations as they explore the varying coastlines all around the world. Some are rocky, some are muddy, and some are sandy. The special characteristics of seashores and the enchanting wildlife that live there will spark the interest of young scientists, encouraging them to take care of this increasingly threatened habitat. An afterword, glossary, and list of resources provide more details about each of the illustrations, including how sand is created, why there are high and low tides, and why certain animals thrive in this particular environment. Teachers can use the precise and comprehensive back matter to assist with instruction for younger readers, and older children can help themselves to a plethora of fascinating knowledge and expand their nature vocabulary. There is also a teacher's guide available for the whole About Habitats series, and be sure to check out all the titles in the About Habitats series as well as the About series. Don't forget to enter our GoodReads giveaway for a chance to win an early copy of the book! Look for About Habitats: Seashores on August 1st at your local library, indie bookstore, or Barnes & Noble.